A chess-addicted teacher tries to spread the love of chess - we love such stories. By the way, this teacher is 61 years old. All the more we had to take a look. Here's sharing this nice feature by Kali Thiel. SHEBOYGAN — If you see a car around town with a “Chess Nut” vanity plate, it’s likely Ellen Wanek’s. Wanek, 61, devotes much of her retired life to the game of chess. She’s a coach at four Sheboygan schools, she privately teaches about 10 students every week and she helps out at many of the area’s weekend chess tournaments. “The woman is addicted to chess,” said Al Wanek, Ellen’s husband. Wanek isn’t alone. There’s a growing interest in chess that’s sweeping across Sheboygan County schools, the Sheboygan Press reported. Nearly 200 area youth competed in the annual Acuity Chess Invitational in late February put on by Acuity and the Wisconsin Scholastic Chess Federation. 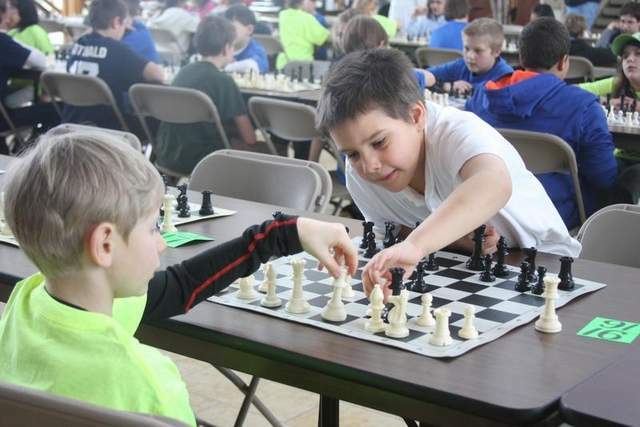 Shawn Chrisman, director of the Acuity tournament, said more than 15 Sheboygan County schools were represented at the weekend tournament and he estimated around 400 youth in Sheboygan County are active in chess in some fashion. The Acuity Invitational is one of about 10 tournaments offered in Sheboygan County from November to March each year. A few years ago, there weren’t even half that many though, said Katie Delahunt, WSCF board member. When Delahunt moved to the Sheboygan area about eight years ago from Milwaukee, she said she was amazed that Sheboygan didn’t have many chess tournaments. Her children had been active in chess at their previous school and she missed having that opportunity for them. Delahunt, the Sheboygan/Kohler Municipal Court judge, said she was instrumental in getting tournaments started in Sheboygan about six years ago and ever since then, chess has really taken off. Wanek said she became involved with chess tournaments after volunteering for one at what was then Holy Name School about four years ago, and she’s been hooked ever since. Read further at the fldreporter and if you have an inspiring chess story to share, do send it to us.